Welcome to Cognitive Workshops, a cognitive therapy training company run by Dr. Lorna Tener, a psychologist in private practice in Ottawa, Canada, and her husband Brian Toller. We have been running Cognitive Workshops for 24 years, presented 80 workshops (52 in Canada, 26 in the UK and 2 in the US) attended by about 30,000 therapists from 54 countries. Now we have decided it is time to retire. Thank you to everyone who has come to our events over the years. It is gratifying to consider the many thousands of people who have been helped to lead better lives because their therapists have received excellent training. We would like to thank in particular the fantastic speakers who have led our events: Melanie Fennell, Paul Gilbert, Deborah Lee, Gillian Butler, Ann Hackman, Mary Ann Layden, Dana Ackley and, of course, Christine Padesky. Christine Padesky has led 67 of our workshops and we are so grateful to her for this amazing partnership. She has been a consummate professional to deal with throughout our years together, teaching inspired workshops that we know from our evaluations are extremely helpful, and doing so with integrity, humour, warmth and real passion. She has also become a great friend. 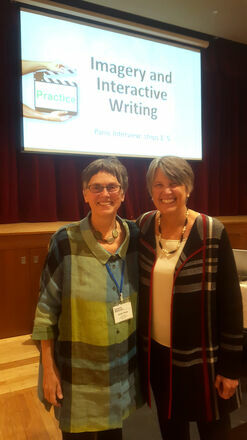 Her partner at the Center for Cognitive Therapy, Kathleen Mooney, has been a great help to us as well, collaborating with Christine on workshop teaching ideas, preparing all the slide decks and handouts -- they are quite a team! Christine is on pace to finish two books this year and is hatching some new ideas for providing training that she will announce later this year. When she formally announces her plans, we will post details here and send you an email. We encourage you all to continue your learning and seek out on-going CBT training that is evidenced-based and effective. Excellent training resources can be found on our site at the CBT Links page. You can also find terrific books from our remarkable bookseller partner, Caversham Booksellers, who has had book tables at almost all our Canadian events. Thank you to Joe Adelaars and his amazing team for their dedication and superb service. Although we are stopping this workshop business, Lorna will continue her private practice in Ottawa for a couple of years. Thanks again for your support and we wish you all the best in the future.